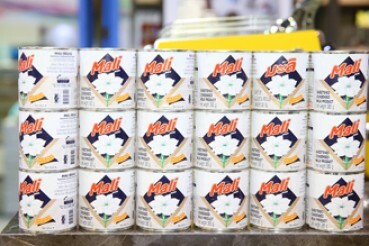 The Thai Dairy Industry Co, which manufactures and distributes Mali sweetened condensed milk, has restructured its distribution system for the first time since the company was established 54 years ago. The move is aimed at pushing its growth and sales to 5 billion baht in the next three years. Deputy chairman Pinit Puapan said the company had recently spun off its dairy production and set up a new company, Mali Group 1962 Co, to handle it. Thai Dairy Industry remains responsible for product distribution. It will also appoint three new distributors to handle its products through traditional trade channels. The move is intended to make its dairy products more accessible to rural consumers. "In the past, distribution was our weak point. But with the restructuring, the new distribution system will be more efficient and help us grow sales at a faster pace than in the past," he said. Apart from the distribution system, the company also plans to adjust its product packaging with an introduction of bigger sizes to respond to increasing demand from industrial customers such as bakeries and coffee shops, whose combined business is worth over 50 billion baht. A single-serving size will also be sold for household use. New products will also be launched to respond to health-conscious consumers next year. In line with these plans, The Thai Dairy Industry expects to spend 300 million baht to install new machines at its factory in Ayutthaya province to help roll out the products with new packaging. The company also plans to stop selling its Mali UHT milk due to fierce competition in this dairy segment. It will, however, re-enter the Thai yoghurt market soon. "There are huge opportunities for sweetened and unsweetened condensed milk in the country. We will refresh our brand to be more modern in order to attract younger customers," Mr Pinit said. He expects the country's sweetened and unsweetened condensed milk market to be worth 10 billion baht annually. Its dairy products sales were 3 billion baht last year, compared with a peak of 4.3 billion baht before heavy flooding hit the country in 2011. Of the total, 80% of sales were generated domestically, with the remaining 20% coming from its 30 country-strong export market. Apart from Thailand, The Thai Dairy Industry this year will appoint two agents to distribute its products in Laos and one agent in Cambodia. The company controls 40% of Thailand's sweetened condensed milk market. Its Ayutthaya factory has production capacity of 300,000 tonnes per year, but is only running at 45% capacity due to the damage caused to the 27-rai plant on the Bang Pa-in industrial estate by the flooding.